developmental disabilities and individuals administering medications in private and public school settings. 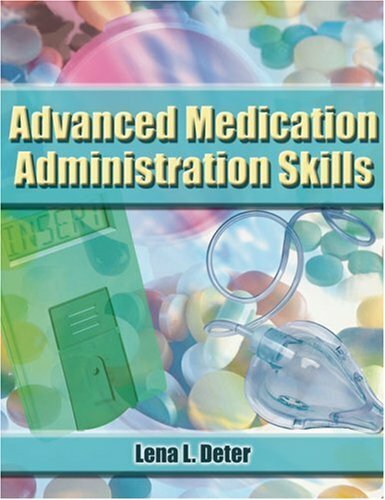 In addition, the book offers licensed individuals a thorough review of advanced medication administration skills and serves as an excellent reference manual for licensed staff. It offers ongoing support to a facility's established medication policies and procedures and serves as the foundation to a strong nursing curriculum. College with a B.S. in Health Education and earned a Masters in Public Health from Boston University in the concentrations of Health Services and Social Behavioral Studies. As a Clinical Reviewer for the Massachusetts Department of Public Health (DPH), Lena oversaw the implementation of the Medication Administration Program (MAP) within over 2,200 Department of Mental Retardation (DMR) and Department of Mental Health (DMH) programs. In doing so, Lena played an instrumental role in defining and instituting clinical and training benchmarks to establish uniformity throughout the state and led the successful development and launch of the program?s clinical review process and the Medication Occurrence Reporting System (MORS). As the Statewide Director of Health Services for the Department of Mental Retardation, Lena continued the development of the MAP within over 1,800 residential programs and contributed to several other DMR health service systems. Her key contributions and achievements include the creation of a formal training curriculum and certification process for the MAP. Lena pioneered the Professional Oversight Model for Nursing, which received approval from the Massachusetts Board of Registration in Nursing.